Google realized that it has ignored the social space for too long and that its services could be more useful if they had a social touch. After launching a site for sharing web pages with your friends and adding profiles to Google Maps, Google should integrate the sharing platform with other Google sites and unify the profiles across all Google services. 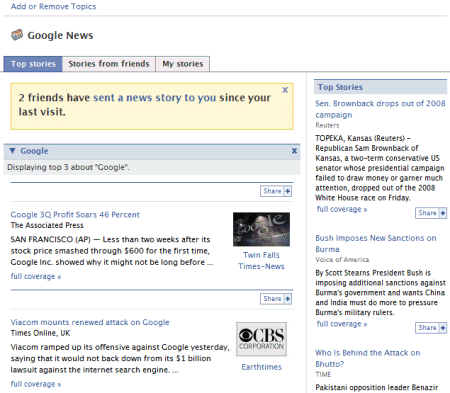 To test the waters for a social news site, Google launched a Facebook app for Google News. The application lets you customize the sections and expands them with more stories without reloading the page, but it only displays a single story for each cluster. You can share a story with some of your friends or post it to your profile, keep track of your shared stories and see a list of items shared by your friends. "Whether it is from our homepage, one of our RSS feeds, or on a mobile device, Google News seeks to connect people with the news that matters to them -- wherever they may be. As part of that goal we are pleased to announce the Google News Application for Facebook. This experimental application enables users to create custom sections or select from a set of pre-defined topics, then browse and share stories with their friends on Facebook," announces the Google News Blog. The unofficial Google Reader Facebook app is already popular, so an official Google app would be even more successful. In the grand scheme of things, Google News, Google Blog Search and Google Reader could be combined into a single application that delivers news from your favorite sources, news recommended by your friends or by Google. The items should be clustered and ordered based on their importance, your reaction to other similar items and your interests. Facebook have some benefits but these option are not on other social site like orkut myspace and twitter.